Water permeates the lives of the Tłįchǫ. In their traditional lands between Great Slave Lake and Great Bear Lake in the Northwest Territories, they use the lakes and rivers, summer and winter, as fishing grounds and transportation routes. Now a Laurier-led team is helping the Tłįchǫ ensure their water stays safe and clean. 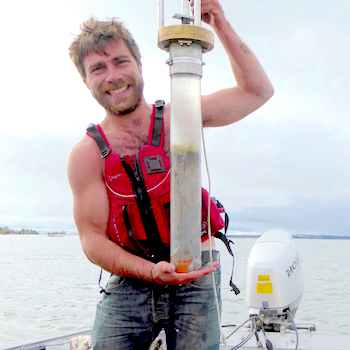 James Telford, a second-year Master of Science student in the joint University of Waterloo-Laurier Graduate Program in Geography, is leading research to analyze aquatic sediment within the Marian River Watershed. He is working under the supervision of Laurier Professor Brent Wolfe and co-supervisor Professor Roland Hall of the University of Waterloo. Telford’s work, which won him a prestigious 2016 W. Garfield Weston Award for Northern Research, will establish baseline conditions for an aquatic ecosystem monitoring program being set up by the Tłįchǫ Government. The monitoring program is designed to keep track of climate change effects as well as effects from a mine expected to open within the next few years. Telford has been passionate about water since he was a kid growing up in Brantford, regularly canoeing on the Grand River and visiting the Great Lakes. He fell in love with the North while doing his undergraduate work, also at Laurier under Wolfe. His undergraduate thesis research took him to Wapusk National Park in northern Manitoba. The “fantastic” relationship with Wolfe and the “really unique opportunity” of a project involving both science and work with the Tłįchǫ Government were what convinced him to stay at Laurier for his master’s degree. Hall has also become a great mentor, says Telford. The Tłįchǫ Government was created in 2005 when the Tłįchǫ Nation ratified a treaty with the Government of Canada, giving it ownership of and jurisdiction over 39,000 square kilometres of land. The Tłįchǫ Government is running the monitoring program with Laurier as its academic partner. Telford started his work in September 2015 and first went to Behchokǫ̀, the largest of the four Tłįchǫ communities, the same month. He is going again in time for World Water Day 2017, for a total of seven trips – and counting. From the beginning, he loved both the land and the people. The land looked pristine – and cold. However, Telford soon started hearing stories from elders about how much things had changed. Throughout watersheds in the North, water levels have been dropping due to a decrease in snowmelt runoff and an increase in evaporation due to climate change. Telford heard that for the same reason, the water taxis that formerly connected the tightly-knit communities haven’t run in years. When he looked at the markings on rocks at the edges of the waterways, he could see how much water levels had dropped. Climate change isn’t the only threat to the watershed. There has been extensive mining in the region for decades – including uranium mines and the now-defunct Giant Mine gold mine, one of the most contaminated industrial sites in Canada. Mining is an important source of income and employment for the Tłįchǫ. However, fishing is also important, culturally and as a source of food, so the Tłįchǫ are highly interested in ensuring their water and fish stay safe. Now a new mine has been approved – including by the Tłįchǫ Government – to open in the south-central region of the Marian River Watershed. The Nico mine, to be operated by Fortune Minerals, will produce cobalt, gold, bismuth and copper. It will be a fairly large operation that presents some additional challenges compared to currently operating mines, says Telford. Arsenic is a human carcinogen that can build up in the bodies of fish and other animals. Telford’s work focuses largely on figuring out what the area’s waterways were like before any industrial activity. This involves taking core samples of sediment from the bottoms of lakes. The older layers of sediment, going back some 500 years, show the natural variation in the concentrations of heavy metals. He found that for decades after the 1950s, heavy metal concentrations were higher than the natural background and what Canadian guidelines stipulate. “Even before the mine has started, we see major evidence of pollution from previous mining activities,” says Telford. Despite the pollution in the sediment, so far, analysis of water and fish – the latter done by a biologist – shows the water is currently safe to drink and the fish is safe to eat, says Telford. The monitoring program is meant to ensure things stay that way. Telford is still a year from completing his master’s degree – not unusual with a project of this level of complexity – but he hopes he will continue to be able to work with the monitoring program even once he’s finished his studies, whether through employment, a future PhD, or both. Telford is grateful for the chance he has had to pursue “really beneficial science establishing support for the monitoring program,” he says.